Roll Over on the Mat is considered an advanced Pilates exercise. However, it is also a wonderful warm-up for your Mat practice by opening your back. Equipment Needed: Mat. If available, handles to reach in to. Warning: Not recommend with those suffering from neck issues. Do not look around when doing this exercise. Maintain your eyes straight up to the ceiling. Roll Over on the Mat is considered an advanced Pilates exercise. However, it is also a wonderful warm-up for your mat practice and prepares you for what is to come. If you are doing the order form Return to Life, this is the third exercise you do! After you have been doing your Roll-ups on the Mat, you simply roll down and continue the rolling. The Roll-up helps stretch the lower back and lower legs. The Roll Over helps open up the upper back and really gets you ready for what is to come later in your mat practice! Think of your legs as stemming from your mid-back. Enjoy the reach! To set up place your arms long by your side unless you have a mat with handles above your shoulders. Then place your hands into the handles and reach from your back. Hugging your legs together reach them long across the room and then overhead. Be mindful not to let them drop on you. Yes, the goal is to reach the floor behind your head but it is not worth letting your legs hang off your back. Instead, your legs reach from your back and towards the mat. The more your back reaches up and over the closer your feet will get to the floor. Once overhead open your legs and roll down. Again, being mindful that your legs do not drop onto your chest. Maintain the space between your thighs and your stomach and chest without lifting the legs to the ceiling. As your body and legs roll down circle your legs together and repeat. After three, reverse directions! Open your legs and reach overhead and then hug the legs together and roll down. The key is to maintain your stability and strength in your upper back. As your legs lower do not let the legs to pull your head or chest off the mat. As the legs lift watch out for swinging and momentum. Use your seat and stomach to lift you up! After three, keep your arms where they are lower one leg to the floor to prepare and flow into your Single Leg Circles. One thing to be aware of in this exercise is how much you stay connected to your seat. 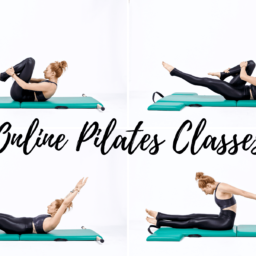 If you feel a hip "click" as you circle your legs, then you'll want to think about how you can press your legs "out" and "away" like you would in the Reformer or Cadillac straps. A hip "click" is a sign that you are not using your seat and instead, hanging off your hip flexors.